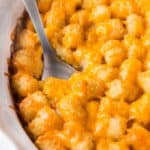 Tater Tot Casserole is a fun recipe that is easy to make and a one-dish meal that is most definitely kid-approved! Brown meat with onions in large skillet, stirring occasionally; drain. Spoon into 2-qt. casserole. Mix soup and milk; pour over meat mixture; top with layers of remaining ingredients. Bake 45 min. or until potatoes are golden brown and casserole is heated through.